Healthy No Bake Cookie Dough Chocolate Covered Eggs + PROTEIN GIVEAWAY! 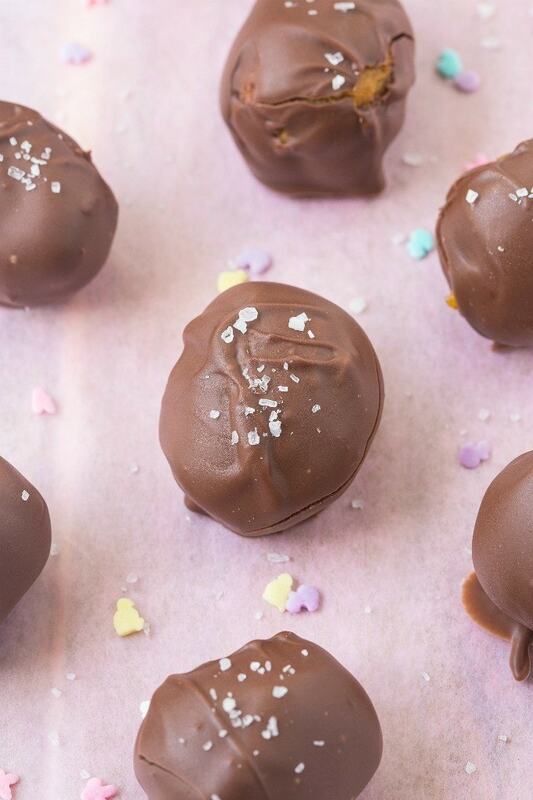 Enjoy all the delicious flavor of Easter candy but with a much healthier twist, thanks to these healthy no bake cookie dough chocolate covered eggs! 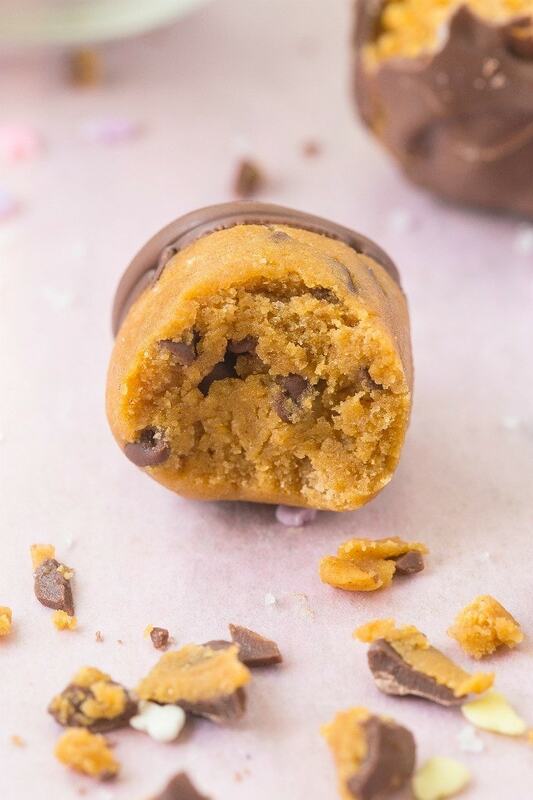 These healthy cookie dough eggs taste like dessert but are a snack to enjoy anytime- Packed with fiber, protein and healthy fats, this recipe is naturally paleo, vegan, gluten free, sugar free AND dairy free! Not only do you guys get this insanely delicious (and easy!) recipe today, I’m also announcing a delicious MONTHLY giveaway happening on TBMW for 2016/2017! 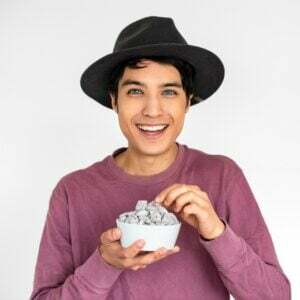 Those who often make any of my recipes which call for a vegan protein powder would know that I always recommend Growing Naturals Brown Rice protein powder. I’ve been a long term user of both the chocolate and vanilla protein powders! Back when I was in Australia, I’d often order their tubs online and always have them on hand. After trying out a plethora of vegan protein powders, I was impressed with the Growing Naturals range. Unlike many on the market, their protein powder did NOT resemble a sand pit and was absolutely perfect for using in recipes! 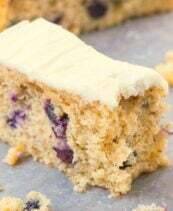 In fact, their vanilla protein powder was my ‘go-to’ in this vanilla cake batter oatmeal and this original cake batter oatmeal. I’m stoked to announce that for all of 2016, I’ll be sharing a recipe each month using their delicious vanilla or chocolate protein powder. Not only that, but we’re going to do something fun here too. Each month, TWO readers will each win a protein prize pack from Growing Naturals, along with a batch of whichever recipe I make using it! Not only that- I’ll also be throwing in the ingredients I used to make it so you too can recreate it! How do you enter? Simply follow the Rafflecopter widget below and simple as that- You’re in the draw! When it comes to Easter, I’m a huge fan…of the day after the main event(s). The discounted candy, eggs, bunnies and LINDT GOLD BUNNIES make my (fat) heart go absolutely GAGA. Seriously, my sister and I would go at 7am to the supermarket, grinning like Cheshire cats over our (potential) goodies. I’d always hunt down the Turkish Delight eggs and my sister would get the honeycomb ones. We’d both tackle the Lindt varieties, and often leave with enough loot to last us until the forthcoming year. This year, seeing as I’m not back in Australia grinning like a Cheshire cat with Niki over our post-Easter loot, I thought I’d share a delicious recipe for DIY Easter Eggs which require no baking and are accidentally healthy! I wanted something fun in the centre (let’s not discuss hollow eggs…..fail whale), so opted for a cookie dough twist. Once formed into an egg shape, I gave them a chocolate coating and voila- Healthy No Bake cookie Dough Chocolate Covered eggs! 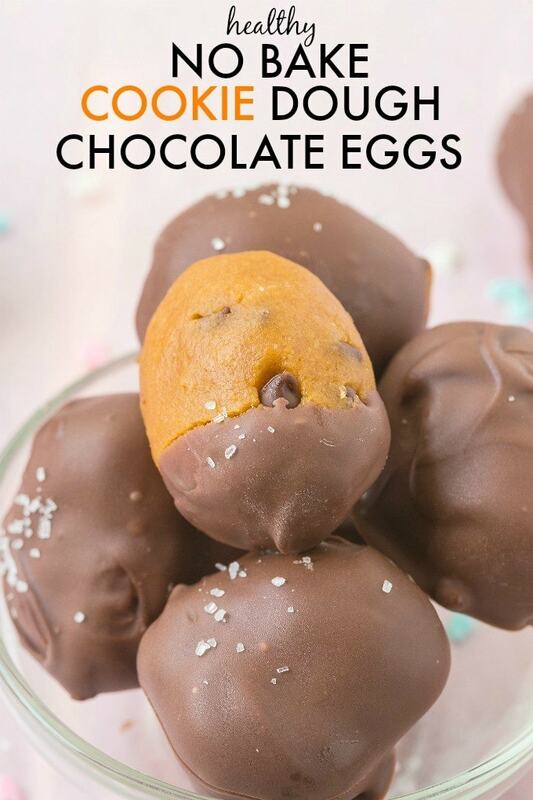 These Healthy No Bake Cookie Dough Chocolate Covered Eggs may look fancy-schmancy but trust me- They are SO easy to whip and ridiculously healthy too, you could pretty much eat them any time of the day too! The centre ‘cookie dough’ portion is packed with protein, fiber and healthy fats and the exterior is simply melted dairy free chocolate or sugar free chocolate (I’ve only tried this brand over here). Although this may be a little more time consuming that my usual no-bake recipes, the final process is worth it- Cracking the delicious, chocolate exterior into a fudgy cookie dough centre = BLISS! 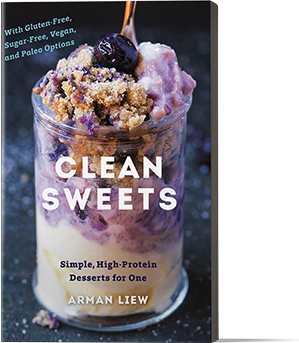 These healthy treats are also suitable for those following a vegan, gluten free, dairy free, sugar free AND paleo lifestyle! HACK! Impatient like I am? That’s a-ok! Line a large plate with baking paper and place them in the freezer for 10 minutes. While it’s ‘freezing’, start prepping your melted chocolate and once it’s done, remove and start the dipping! Make these healthy No Bake Cookie Dough Chocolate Covered Eggs and enjoy all things candy eggs 364 days a year. The other day is your birthday and you should NOT be eating these then. These healthy no bake cookie dough chocolate covered eggs taste like dessert but are a snack to enjoy anytime- Packed with fiber, protein and healthy fats, this recipe is naturally paleo, vegan, gluten free, sugar free AND dairy free! In a small mixing bowl, combine the dry ingredients and mix well. Melt your nut butter and maple syrup and pour into the dry mixture. Mix until a crumbly texture remains. If the mixture is completely cool, add the chocolate chips. Using a tablespoon at a time, add the dairy free milk of choice until a VERY thick batter is formed. Form into egg shaped bites and place on lined plate. Refrigerate for 30 minutes, or until firm. Once firm, melt your chocolate of choice and using two spoons, dip each egg into the mixture until fully coated and place back on the lined plate. Sprinkle with sea salt and allow to firm up before enjoying! * Can sub for oat flour, oats or almond flour- However, you'll need to reduce dairy free milk considerably. *** You'll most likely need more than 1/4 cup. These can be kept at room temperature but are best refrigerated and lightly thawed before enjoying! Do you get excited for the day AFTER Easter? …. Yes. Love this! Easter candy is a serious weakness and this, this is AMAZING! Love a healthier take on sweets. Then I can eat more 😉 Protein pow pow for the win here! I use protein powder in so many different ways. Very hard to pick a favourite. I think maybe waffles would be my top. I am definitely not waiting until Easter to make these! It’s happening soon! Oh, and I love using protein in smoothies and pancakes. I have a slight obsession with breakfast foods! I use protein powder to make my own protein bread in the microwave. Top with PB+J!! Yum. Today I can definitely leave you a love comment for these eater eggs. Cookie dough is always a winner in my book. Chocolate covered even better! I love that you sprinkled them with sea salt. I like to use it in my smoothies and pancakes. I use protein powder in my morning breakfast shakes as well as in these delicious recipes! Is it almost Easter already?!?! Geez I can’t keep up. These look amazing! Protein powder in the protein fluff on my pancakes is definitely my favorite way to use protein powder! I’m so excited for the monthly giveaways! I’ve never tried Growing Naturals before. PS. I can’t believe its already almost Easter. I hate when it comes so early! Though I do like that it means I can eat Jelly Beans to my hearts content without judgement…. 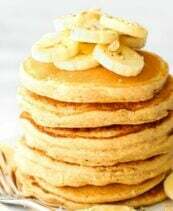 I love to add protein powder in pancakes and in bars/bites for a protein packed snack! I’m so excited about the monthly giveaways! That’s such a great idea. I’m always drooling over every one of your recipes so I just hope I win some time! I use protein powder to make a thick, pudding like dessert. I use protein powder for shakes and smoothies. I usually drink protein powder as an easy breakfast. These look tasty, I’m excited to try them. My favorite way to use protein powder is in smoothies. would whey protein powder work? Yum! I don’t use a lot of protein powder per say, but I love peanut flour and generally use that in any recipe calling for “protein powder of choice.” I put that in smoothies, oatmeal, and sometimes mix it in with maple syrup, vanilla, and cheerios and throw it in the freezer– it tastes like my mom’s “butterscotch haystack” cookies from my childhood, minus the marshmallows and chow mein noodles! ummm these look amazing and you formed the eggs so well LOL is that a weird compliment? I’m so bad at forming eggs when I make easter desserts lmao. Can’t wait to try these!! My favourite way to use protein powder is in a good ol’ fashioned smoothie. Also, my sister has started making protein custard, which is basically magical unicorn food, so that might become a new favourite. I use protein powder to make protein bread and protein cheesecake, both are SOOOO amazing and taste decadent! protein powder in smoothies or oatmeal for sure! I will be making these ASAP! I use protein powder for my husband’s overnight oats. I look forward to your innovative recipes! You mean I have the chance of trying one of Arman’s originals by the Arman himself?! Random generator, please pick me. I am boring and pretty much just use protein powder in smoothie. There are so many types out there, so I am always nervous I’d use one that didn’t work. In shakes or in baked goods. You’ve got to check out the dessert I had this weekend. Chocolate chip cookie dough sandwiched between two chocolate chip cookies. It was AMAZING. I want it every day. My favorite way to use protein powder is in smoothies or my morning bowl of oats! My favorite way to use protein powder is in baked goods. This recipe has Easter written alllll over it. I’m always scared to bake with protein powder because of the texture. Glad to see someone else will do the dirty work for me! Haven’t used it before, but sounds like it’s a,aging in all sorts of things so would love to give it a go! I use plant based protein powder every single day in some way or another… I go through it so quickly. My favorite breakfast combo lately has been 2 scoops protein (currently going through a rice/pea/hemp blend), 2 tablespoons ground flax, 1 cup soy milk, and whatever frozen fruit I have on hand. I make it when I first wake up, then let it sit in the fridge while I get ready for work. When I finally get to dig in, it has thickened up into a delicious slop of goodness!!! I like protein powder in baked goods once in a while. 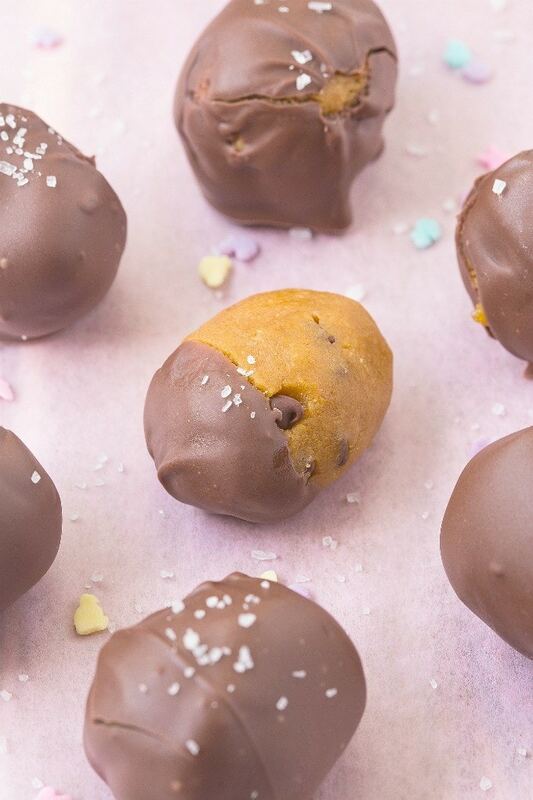 These Easter eggs look yummy — especially with coconut flour, and I have a bag of Lily’s chocolate chips in my fridge. I make homemade protein bars and use a variety of protein powders for them. ? I like to add protein powder to pancakes and muffins. I also add it to coffee. I like to use protein powder in my green smoothies. I use my protein powder in my coffee and sometimes add it to yogurt too. i use protein powder in my overnight oats and smoothies every morning. 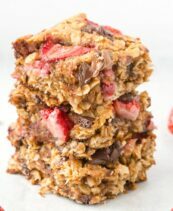 I love all your no bake recipes! I love using protein powder in mug cakes and pancakes! I make them every day! The day after holidays are always great haha. I just stoked up on some super cheap Valentine’s Day Candy! I got 4 boxes of chocolates for the price of one. I throw it in my oatmeal! Lindt bunnies sound so luxurious but also kinda gory. Like, biting off the head of a bunny and having it’s chocolate guts bleed out all over your face. A wonderful thing for some perhaps. Ahh I need to make these for Easter! Reese’s Eggs are my favorite candy ever, but I’m sure these will give those a run for their money. oh man these look good! Im just getting more into using protein powder, in smoothies and oatmeal for starters but Im ready to get more creative with it!! 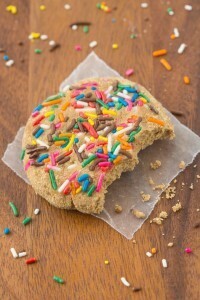 These do look easy and delicious! I love to mix a little protein powder in my Greek yogurt for snacks. Can’t wait to make these. I had to to order the coconut flour and protein powder from Amazon so as soon as they get here I am going to give this a try. I plan to use almond butter as well as almond milk. I stick mainly with smoothies for my protein powder. I’ve used some brands in the past to try making treats, but they never com out that great. These are so cute! Love the option of making something different for Easter! For me, I mostly use my protein powder as a shake post workout! Boring I know! But I also love mixing it into yoghurt to make like a chocolate pudding or mixing with eggs and bananas to make pancakes! I like to use protein powder in your recipe for mocha peppermint balls! 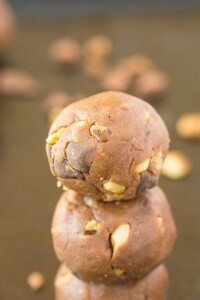 I like using protein powder to add an extra boost of protein to baked goods and your no-bake balls! Is it a coincidence that I’m using the chocolate pudding casein TOMORROW for a smoothie bowl?? LOL! My fave way of using protein powder are as a way to flavor and thicken my smoothies and make healthy ice cream, as well as mixing it with water to create a frosting! It’s so delicious! I can’t believe that April’s almost coming up! Better get the Easter egg game on! These are just too cute to eat! (just kidding obviously I would eat the WHOLE DAMN BATCH). I love protein powder in smoothies obvs, but I love making protein mug cakes for a late night treat! Wow what a fun Easter treat! Oh how I love coconut flour and it is all thanks to you! Keep up the great work! 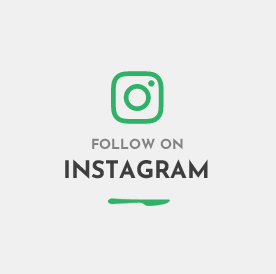 You are so creative and your recipes are amazing! My favorite way to use protein powder is blending it into a green smoothie! I’ve just started subscribing to your blog so up until now all I’ve used protein powder for was smoothies. Looking forward to more wonderful ideas! Thanks. I’ve never used protein powder before but I would love to try it! This looks really good! I like using protein powder in smoothies and shakes. How do you always make everything look so good?!? I haven’t had any easter eggs yet this year, but I know what I’ll be doing tomorrow, thanks to you! I finally finished the tub of vanilla protein powder that I hated and am looking for a new brand to try! I love adding a scoop to my oatmeal or greek yogurt for a protein packed breakfast! 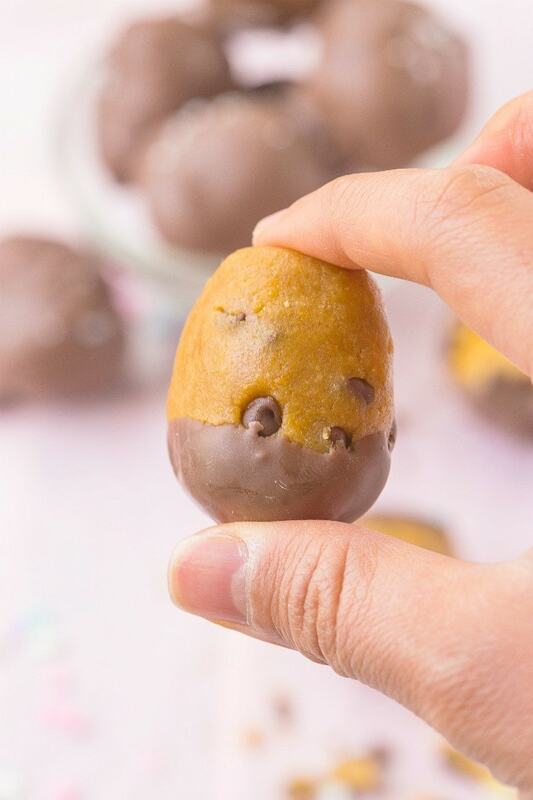 Cookie dough eggs are brilliant! I generally add protein powder to my smoothies but I want to start using it more in baking. Love protein powder in oatmeal. Mmm! I’m way too simple: protein powder (I love the Vega Sport Performance brand) in unsweetened cashew milk. I really should learn how to bake with it! I use protein powder in ALL my smoothies and have just started making “baked” goods with it! I like making protein fluff! I just use protein powder in protein shakes. Love Growing Naturals protein powder in my oatmeal! i like to add it to oatmeal or use it for protein pancakes! I like using it in my oatmeal. My favorite way to eat protein powder is protein ice cream, protein powder and bananas in the food processor. These eggs look amazing and I’m looking forward to making them for my family. Oooh Easter. I love that you use Rice Protein. I have used pea protein & know how to bake with it now, but I’ve yet to learn Rice Protein!! Everything I see you make with it looks killer. I love using protein powder in my green shake every morning and making breakfast cookies. I love protein “ice cream” aka green protein smoothies so thick that I have to eat it out of a bowl like ice cream haha. And I also love making protein spreads for rice cakes. This recipe sounds amazing! 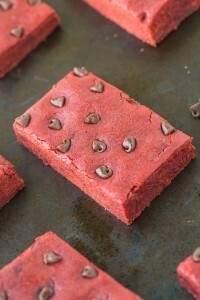 I’d love to make these…But I’ve never actually used protein powder! I’ll have to try it soon. Yes please put these in my basket!!! Honestly, some of the best recipes that I’ve used protein powder in have been either your recipes or Amanda’s recipes. It tastes good in mug cakes! 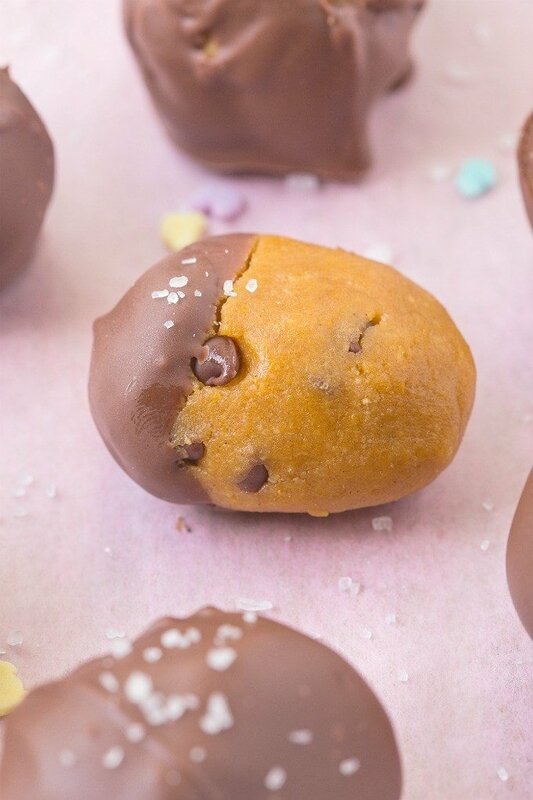 And those no bake cookie dough stuffed eggs? WOAH. My favorite way to use protein powder is in smoothies and a couple recipes from various blogs (one being yours!). And here he comes, taking over Easter treats by storm!!!!! Toss me a couple eggs, now. I love using protein powder in these banana muffins I make. Oh, and in smoothies, shakes, and oats of course! I’ve been obsessed with making protein cookies and brownies with protein powder. 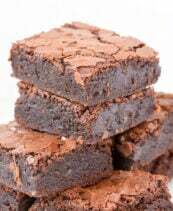 Its such a low carb substitute for flour and its awesome when your vegan because it just ensures you get extra protein in! I haven’t used protein powder in anything other than smoothies. Fav way to use protein powder(usually a raw rice protein powder…aaahhhmazing) is in my morning oatmeal. I’m a vegan lifter, so just that little extra before a workout is great. Pingback: Healthy Grain Free Chocolate Brownie Protein Cookies + Protein Giveaway!